Bosch is bringing the human element back to production lines. Courtesy Bosch. As times change, the manufacturing industry is reinventing itself. It has to in order to survive—especially for traditional manufacturers such as Bosch, a 130-year-old company built around the automotive assembly line. 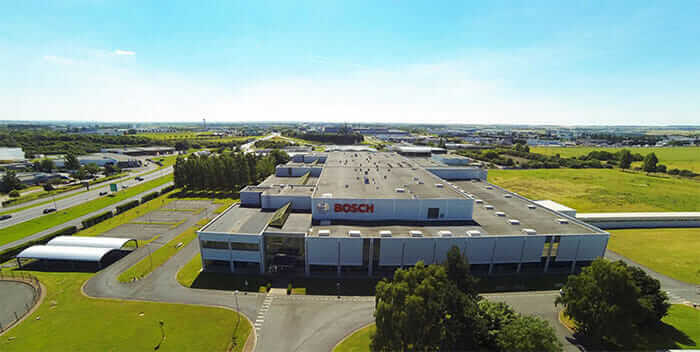 To that end, the Bosch factory in Mondeville, France, which does large production runs of electronics for the automotive industry, is deploying digital tools in all of its workshops and connecting systems for better productivity. But creating a factory of the future requires more than just evolving to stay competitive; it means working with today’s challenges (like high energy and labor costs) with an eye on progress and persistence. Here are four ways Bosch Mondeville has transformed its factory model today—for tomorrow. The factory in Mondeville. Courtesy Bosch. “We’ve gradually moved from mass production to industrializing innovative products,” says Théophile Guettier, project manager for 3D design at Bosch Mondeville. To shift from its original setup for manufacturing automotive electronics, the site has gone through a digital transformation, adding skills to support companies seeking to industrialize small- and medium-scale production runs in record time. Bosch Mondeville has extended its expertise in automobile electronics to certain niche markets—such as manufacturing active antenna arrays for Sigfox, a communication specialist for IoT, and top-of-the-line hi-fi speakers by Devialet. Adopting a “manufacturing as a service” model, the Mondeville factory focuses on adding strength and sustainability to Devialet’s production system. This partnership, which requires precision manufacturing with high-performance materials, represents a turning point for the Mondeville site (winner of the Factory of the Year 2017 award from L’Usine Nouvelle, a weekly French business and technology magazine). Engineers and sales reps are assigned to specific clients based on their needs. Courtesy Bosch. Digital technology, once used mostly for research purposes at Bosch, has spread to workshops where dozens of employees manufacture products in small production runs. “It may seem odd, but manual labor is back thanks to digital technology,” Bagnon says. 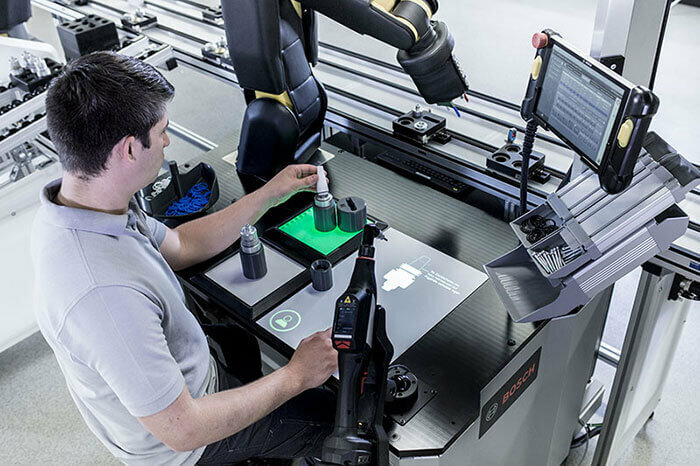 Although assembly line automation has reduced the number of operators per position, digital technology has brought back the human element to the production lines. In real terms, the product lands in the operator’s hands after it has been identified through its RFID chip. Once the editing station is connected, the assembly lines appear on a screen. Light guides then help the operator place the pieces correctly and in the right order; this allows for a manual assembly that limits the risk of error to the lowest level possible. See Bosch’s Pierre Maillot speak about Mondeville at Autodesk University. 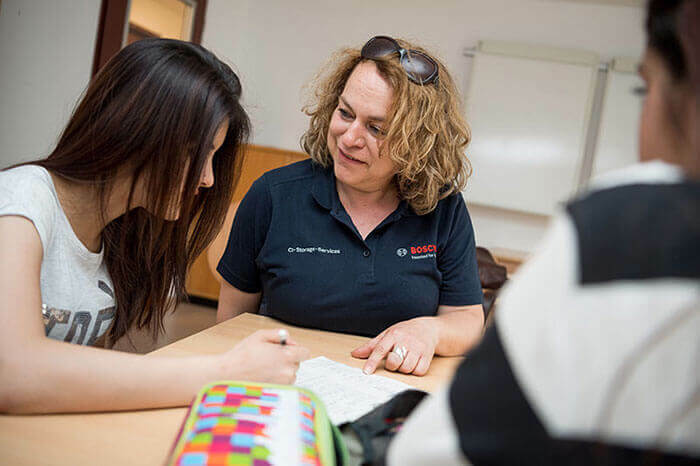 Bosch hired new engineers and sales reps in order to match client requirements with the Bosch organization. By reorganizing its factory site, the teams at Bosch Mondeville have focused on these new customer relationships in the drafting and design phases. The Bosch teams exchange information with clients on the different limitations in production, creating conditions for increased productivity. Now, Bosch Mondeville can produce either big volumes or small serials with high customization. The addition of Bosch APAS collaborative robots is helping improve production. Courtesy Bosch. Integrating a digital workshop unit, similar to a “fab lab,” into factory production has given Bosch the flexibility to work with a range of clients. It operates much like a startup that encompasses both Bosch employees and external clients such as Safran, Zodiac Aerospace, and Agrial. This approach allows Bosch Mondeville to not only develop new products based on its existing catalog but also respond more quickly to urgent requests to produce new parts that are increasingly technical and innovative. Devialet is a sound-technology startup founded in 2007 and based in Paris. The company’s original technology, Analog Digital Hybrid (ADH), is a patented amplification invention that helped bridge the gap between analog and digital technology, offering sound quality without distortion, saturation, or noise. In 2010, Devialet introduced a line of hi-fi amplifiers, and in early 2015, after successfully downsizing its technology, it introduced Phantom, designed for an ultradense physical sound impact. Striving to make its products more accessible, Devialet has developed and industrialized Phantom, which has been available in Apple stores since December 2015. In 2016, to meet the challenge of large-scale production, Devialet partnered with Bosch Mondeville to produce Phantom.